Le chef d’orchestre Ira Levin a dirigé avec élan et beaucoup de naturel, l’Orchestre symphonique a joué avec fermeté et aplomb, le choeur de l’Opéra de Québec n’a jamais chanté mieux ni plus subtilement. The orchestra under Ira Levin was the great centre of interest: if the tension was sometimes lacking on stage, it was surely present in the strong work of the conductor with his responsive players: the music came out colourful, rhythmic, always interesting and alive. Es ist ziemlich unglaublich, welche Qualität Levin mit dem Orchester bei einem so anspruchsvollen Programm erreichen konnte. A native of Chicago, Ira Levin began piano lessons at the age of 9 and entered the Northwestern University School of Music’s program at 12 years old. At 17, he began his piano studies with Jorge Bolet at Indiana University, following him the next year to the Curtis Institute of Music in Philadelphia, where he became Bolet’s teaching assistant as well. While at Curtis, he studied conducting with Max Rudolf, and appeared in performances of Leonard Bernstein’s Age of Anxiety, conducted by the composer himself. In 1985 he was engaged as assistant to Michael Gielen at the Frankfurt Opera, where he made his conducting debut with Fidelio. He then went on to become Principal Conductor at the Bremen Opera from 1988-1996, and at the Deutsche Oper am Rhein, Düsseldorf, from 1996-2002, as well as holding the position of Principal Guest Conductor at the Kassel Opera from 1994-1998. 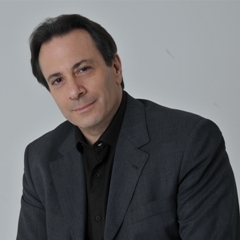 In 2001 he became Music and Artistic Director of the Theatro Municipal and the Municipal Orchestra in São Paulo, Brazil, the first North American to head one of the most important opera houses in South America. He held this post from 2002-2005, bringing the Municipal and its orchestra national and international acclaim. He conducted the first Janácek opera in Brazil’s history, Jenufa, in 2004, and the Brazilian premieres of Janácek’s Missa Glagolitica, Shostakovich’s 4th Symphony, Mahler’s 10th Symphony, Sibelius’ Kullervo, Schoenberg’s Concerto for String Quartet, and many other classic and modern works. In November of 2004 Ira Levin and the Municipal Orchestra of São Paulo won the coveted Carlos Gomes Award for the best orchestra in Brazil. From 2007-2010 he was the Music and Artistic Director of the National Theater of Brazil, in Brasilia, bringing the orchestra hugely diverse concert seasons and international attention, as well as one of the largest educational programs in South America, attended by over 45,000 students from public schools. He also toured with the orchestra in Brazil and South Korea. Since this time Ira Levin has performed at opera houses and with orchestras throughout the world. These include the Semperoper Dresden, the Leipzig Gewandhaus, the Frankfurt Museum Orchestra, the Düsseldorf Symphony, the Duisburg Philharmonic, the Bruckner Orchestra Linz, the Badische Staatskapelle Karlsruhe, the Bremen Philharmonic, the Portuguese Symphony Orchestra Lisbon, the State of Mexico Symphony Orchestra, the National Symphony Taiwan, the São Paulo Symphony Orchestra, the Dublin Opera, the Montpellier Opera, the Norske Opera in Oslo, the Cape Town Opera, and many others. Ira Levin has conducted more than 1000 performances of over 60 operas. His concert programs as a conductor and pianist have included most of the standard repertoire and many lesser-known works. He has worked with many internationally renowned instrumentalists, singers and stage directors. Between 2011 and 2015 he was the Principal Guest Conductor at the Teatro Colón in Buenos Aires, where he made his operatic début with Lohengrin in September 2011, and was invited back for the 2012 season to conduct the first-ever staged performances of Enescu’s Oedipe in the Americas. In 2013 he also made his début at the Berlin Philharmonic Hall, conducting his orchestration of Busoni’s Fantasia Contrappuntistica and Schumann’s 4th Symphony with the Berlin Symphony Orchestra. In this concert he also performed Mozart’s Piano Concerto No. 14. In August 2014 he conducted Verdi’s Requiem with the Québec Symphony Orchestra at the Grand Théâtre de Québec. Further highlights of the 2014/15 Season included concerts in Porto Alegre and Sao Paulo, as well as Madam Butterfly at the Teatro Colón. The 2015/16 season saw him conduct Don Carlos and The Fiery Angel at the Teatro Colón as well as revival of Falstaff with the Hannover State Opera, a successful collaboration that began in 2012. In Hannover again he conducted La forza del destino. He made his début at the Bucharest National Opera in March of 2016 conducting Oedipe. The following season he conducted several performances of Marschner’s Der Vampyr as well as Stravinsky’s Pulcinella at the Grand Théâtre de Geneve, marking his début at this illustrious house. More recently he made his US operatic debut with the New York City Opera conducting Respighi’s La campana sommersa and took over the musical direction of Schumann’s “Scenes from Faust” performed with the Suisse Romande Orchestra and the chorus of the Grand Theater Geneva. This season he will conduct Katya Kabanova at the Theatro Sao Pedro in Sao Paulo. Uruguay. His 2012 orchestration of César Franck’s Piano Quintet, entitled Symphony in F minor, had its successful world premiere with the Helsinki Philharmonic under the direction of Leif Segerstam in October 2014. His 2014 orchestrations of five Rachmaninoff works have been successfully performed by the Buenos Aires Philharmonic, Porto Alegre Symphony and the orchestra of the SODRE, Montevideo. Most recently, his 2015 orchestration of Reger’s piano masterpiece, Variations and Fugue on a theme by J.S. Bach, received its successful world premiere in Turku, Finland in February 2016, also under the direction of Leif Segerstam. Ira Levin conducted this and other works by Reger with the Brandenburg State Orchestra and with the Malaga Symphony later that year. With the London Symphony Orchestra he recorded a CD of works by the American composer Michael Colina, which appeared in 2011 on Fleur de Son/Naxos, receiving excellent reviews. 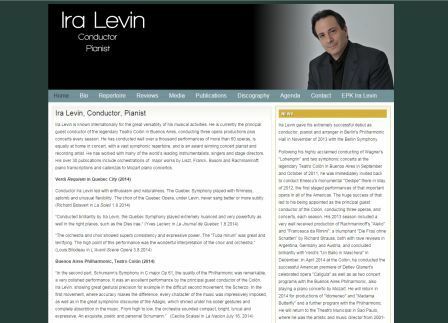 A second CD with Levin and the LSO featuring works by Colina was released in September 2012. A 2014 recording of Colina’s Requiem, Requinauts, with the Royal Scottish National Orchestra and Chorus was released on Fleur de Son/Naxos at the end of 2014, again to critical acclaim. Other CDs include the first modern recording of the 1899 1st edition of Bruckner’s 6th Symphony with the Symphony Orchestra of the Norrlands Opera, released in 2009 by Lindoro. The world premiere recording of the 1892 1st edition of Bruckner’s 2nd Symphony will be available in 2016. More recently, he appeared in the Maximum Reger documentary, named by BBC Music Magazine as the “standout classical DVD release of 2017”, performing some of Reger’s works with the Brandenburg State Orchestra. An award winning pianist, he won the 1st prize at the American Chopin Competition in 1980. He has performed throughout the United States, South America, and Europe. He continues to appear in recital and concert, often leading concertos from the keyboard as well.